The Wall Street Journal recently carried an article entitled “E-Yikes: Electric Bikes Terrorize the Streets of China.” The article describes difficulties arising from the fact that nearly 120 million electric (battery) bicycles (E-Bikes) are now in operation in China, as people have abandoned mechanical bicycles and highly-polluting petrol motorbikes. However, to the millions of owners, China’s E-Bikes are a boon, not a bane. E-Bikes are best understood in terms of human aspiration (just like cars in America or Western Europe). People generally seek to improve their lifestyles. Research at the University of Paris, the University of California, the University of North Carolina and elsewhere has clearly demonstrated a strong relationship between higher incomes and higher rates of economic growth where people have greater personal mobility. This is what the E-Bike provides. In the large urban areas of the 21st century, even the dense Chinese urban areas, travel is highly dispersed. The efficient operation of the urban area requires an ability to travel from any point in the urban area to any other point in a short amount of time. As effective as public transport can be for trips within the dense (but generally small) urban core or to the urban core from suburban areas, a large share of trips simply cannot be feasibly made any other way than by personal mobility. This includes walking, for very short trips and bicycles for somewhat longer trips. But, it also includes substantial and increasing travel by faster modes of transport, particularly cars and two-wheeled vehicles. E-Bikes have greatly improved mobility. At the same time, the E-Bike has enormously reduced both the air pollution and carbon footprint of two-wheeled personal mobility. This is not to discount the traffic and other difficulties. However, the Chinese, like their western counterparts, will continue to seek better lives and that means greater personal mobility. It means that E-Bike usage will continue to grow and that car usage will also continue to grow, as incomes rise. While that will make traffic congestion even worse, the spectacular automobile fuel efficiency improvements ahead will allow massive expansion of personal mobility, while moving in the right direction with respect to the carbon footprint. In the final analysis, the Chinese (and the Indians, Indonesians, etc.) would like to live as well as we do in the United States and Western Europe. And why not? 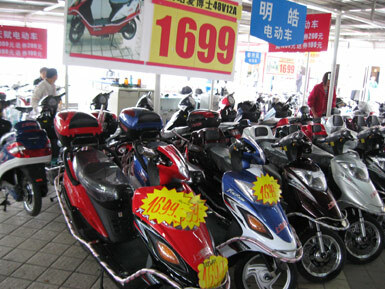 Photograph: E-Bike display at a Suzhou (Jiangsu) hypermarket.